The magicolor 5450's power keeps pace with your business. Single-pass laser technology produces full- color and black-&-white prints at 27 ppm. An Emperon high-performance controller provides fast job processing for Windows, Macintosh, and Linux. Its 667 MHz PowerPC processor gives you the horsepower for complex files and images. 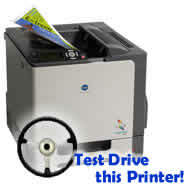 The printer includes 256 MB DDR SDRAM, which effectively doubles your file data throughput and consumes less energy. It's equipped with a Gigabit Ethernet interface for high-speed network printing in busy business workgroups. Revolutionary color technology is built in to generate outstanding prints. 9600 x 600 dpi Photo ART contone quality generates over 4000 colors per dot for photographic detail and smooth color gradients. automatically adjusting color for you. The magicolor 5450 has industry-standard ICC color matching built in for automatic color rendering. To ensure color stays consistent on every print, every day, the printer uses enhanced Automatic Image Density Control. Its small size is complemented by a small price for affordable color printing every day. A small size allows the magicolor 5450 to fit easily on the desktop—or convert it to a free- standing model with a printer cabinet. This desktop color laser uses long-life toner cartridges that yield 6,000 or 12,000 pages for low-cost-per-page printing. In a complex network environment, the magicolor 5450 shows off its multitasking side. PostScript 3 and PCL 6 languages support popular business applications, allowing the seamless creation and processing of all your color documents. Mixed network support for NetWare, TCP/IP, EtherTalk, and NetBIOS/NetBEUI ensures easy integration into your network configuration. Network administrators can count on the PageScope™ Net Care web-based utility for remote installation, management, and configuration of both KONICA MINOLTA and non-KONICA MINOLTA printers. Get real-time supply status, manage, and troubleshoot printers from virtually anywhere using your web browser and PageScope Web Connection. Enterprise Management System Plug-ins are available for seamless printing from OpenView, NetView, Unicenter, and Microsoft Management Console. A plug-in is also included for network administrators using Web Jetadmin. Effortless operation is at your fingertips with the magicolor 5450. Get out of the box and running in just minutes with pre-installed toner and auto-install software that automatically detects your printer on the network and guides you through setup. Comprehensive printer drivers simplify printing with collation, fit-to-page scaling, separation pages, watermark, tray selection, and secure printing options. The Desktop Status Monitor tells you the status of your print job and supply levels with a pop-up window on your monitor. Print Media: Plain paper, thick stock, glossy stock, OHP transparencies, laser-quality labels, and envelopes. Automatic duplexing on plain paper only.